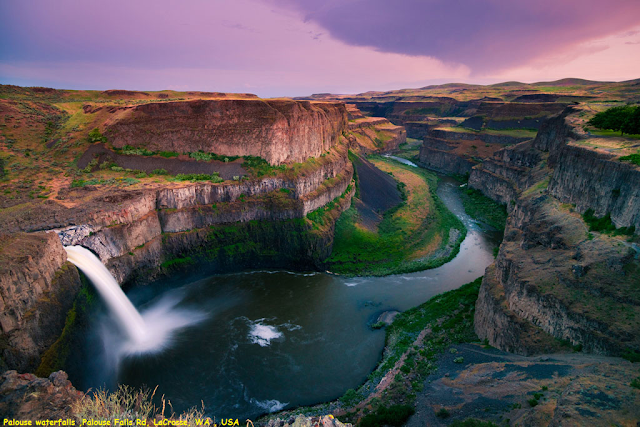 The Palouse Falls lies on the Palouse River, about 4 mi (6 km) upstream of the confluence with the Snake River in southeast Washington, United States. The falls are 198 ft (60 m) in height. The falls consists of an upper falls with a drop around 20 ft (6.1 m), which lies 1,000 ft (305 m) north-northwest of the main drop, and a lower falls, with a drop of 198 ft (60 m). The canyon at the falls is 115 m (377 ft) deep, exposing a large cross-section of the Columbia River Basalt Group. These falls and the canyon downstream are an important feature of the channeled scablands created by the great Missoula floods that swept periodically across eastern Washington and across the Columbia River Plateau during the Pleistocene epoc. Carved more than 13,000 years ago, Palouse Falls is among the last active waterfalls on the Ice Age floods path. This natural wonder was named Washington’s state waterfall in 2014, when the state Legislature passed a bill written by local schoolchildren, who advocated for the designation. Palouse Falls is an artist’s dream, and many a painter or shutterbug has set up an easel or camera and tripod to capture the falls in the changing light. Others make the trip in all four seasons, when the water is high, low or frozen, because they understand that once is not enough when it comes to seeing Washington’s own state waterfall.